Baldwin has a 60 year legacy of craftsmanship and innovation. Rated #1 in quality by builders and contractors, Baldwin is pleased to offer a line of luxury hardware for the discriminating consumer, our Prestige Series. Feel the difference - Baldwin hardware is solid throughout. With a 60 year legacy of superior style and quality, Baldwin is the choice for an elegant and secure presence. The refined styling of the Wesley handleset is characterized by intricate arches accented with layers of beveling. Exuding a sense of timeless beauty, the oval shape and sophisticated lines of the Carnaby knob make a lasting impression. The crisp, clean appearance of the Satin nickel finish adds to the overall look of the product and brings a modern feel. Prestige Wesley Single Cylinder Satin Nickel Handle Set with Carnaby Entry Knob and SmartKey Baldwin has a 60 year legacy of craftsmanship and innovation. Rated #1 in quality by builders and contractors, Baldwin is pleased to offer a line of luxury hardware for the discriminating consumer, our Prestige Series. Feel the difference - Baldwin hardware is solid throughout. With a 60 year legacy of superior style and quality, Baldwin is the choice for an elegant and secure presence. The refined styling of the Wesley handleset is characterized by intricate arches accented with layers of beveling. Exuding a sense of timeless beauty, the oval shape and sophisticated lines of the Carnaby knob make a lasting impression. The crisp, clean appearance of the Satin nickel finish adds to the overall look of the product and brings a modern feel. 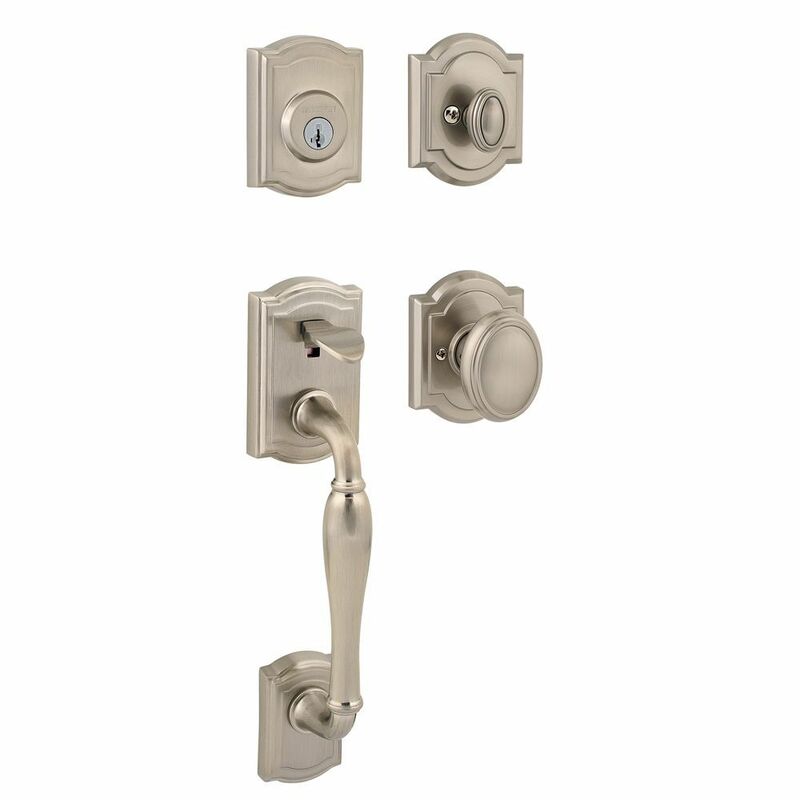 Prestige Wesley Single Cylinder Satin Nickel Handle Set with Carnaby Entry Knob and SmartKey is rated 4.9 out of 5 by 8. Rated 5 out of 5 by HomeDepotCustomer from Great handleset, easy to install very well made. Great handleset, easy to install very well made. Rated 5 out of 5 by RD from Had to replace the original one because the lock kept... Had to replace the original one because the lock kept getting stuck and was very hard to open. New one works fine. Got the same one as before. Rated 5 out of 5 by Anonymous from Stand Out Piece. I had been searching for the perfect handleset for my front door. I went into Home Depot and it's competitor looking for something unique. I could not find anything special. I looked on Home Depot website and found the Baldwin Brand. This handleset is BEYOND beautiful. I called Baldwin and they mailed me a free double cylinder lock for the inside of the door since I have sidelight windows. I could not be more pleased. It's truly a stunning piece!!! Rated 5 out of 5 by DIYer721 from Great look! Great Price! Slightly difficult to understand the directions for proper installation but manageable. Excellent high quality lock and handle set that I would definitely recommend! Rated 5 out of 5 by thebrooksfam from Super Easy Install and Re-Key Absolutely beautiful, super sturdy and super easy to install and re-key. SmartKey re-key took less than one minute per lock.